I had such a great time making the boxes with friends last night! I should have taken pictures of them, because everybody put their own personal touches on theirs, and no two were exactly alike! 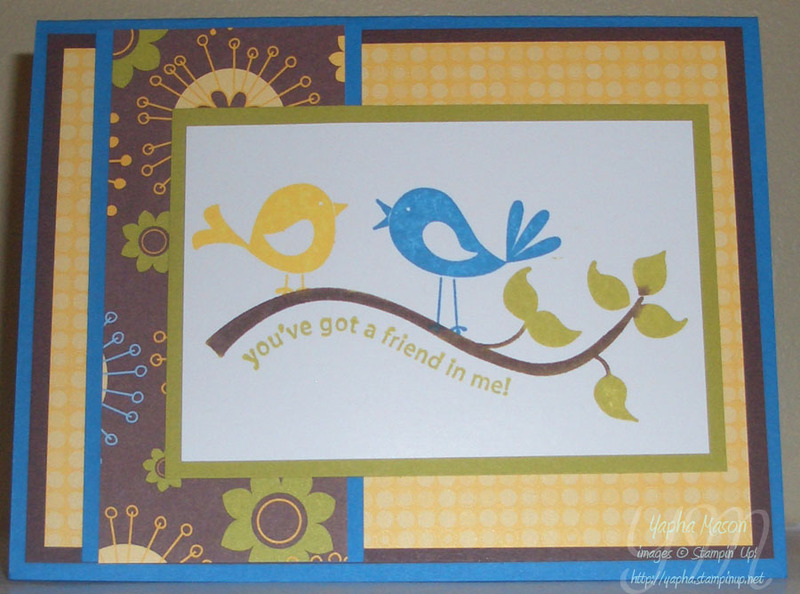 Here is a card that is done in the same color and the same paper. I just love this Good Morning Sunshine paper! It s so bright, and, well, sunshiney! I borrowed the layout of this card from Cathy. Since there are no in-color markers, I used the Kiwi Kiss ink pad on the leaves first, and then the Chocolate Chip Stampin’ Write Marker on the branch. Even the parts of the branch that had some Kiwi Kiss on them look fully Chocolate Chip.